Maxxis UK is in celebration mode following a hugely successful weekend (August 3rd – 5th) for its team and sponsored riders at the ‘Ard Rock Festival in Swaledale. Maxxis staff and supporting stars spent the weekend taking on the challenging course and showing lots of love for the MTB community. 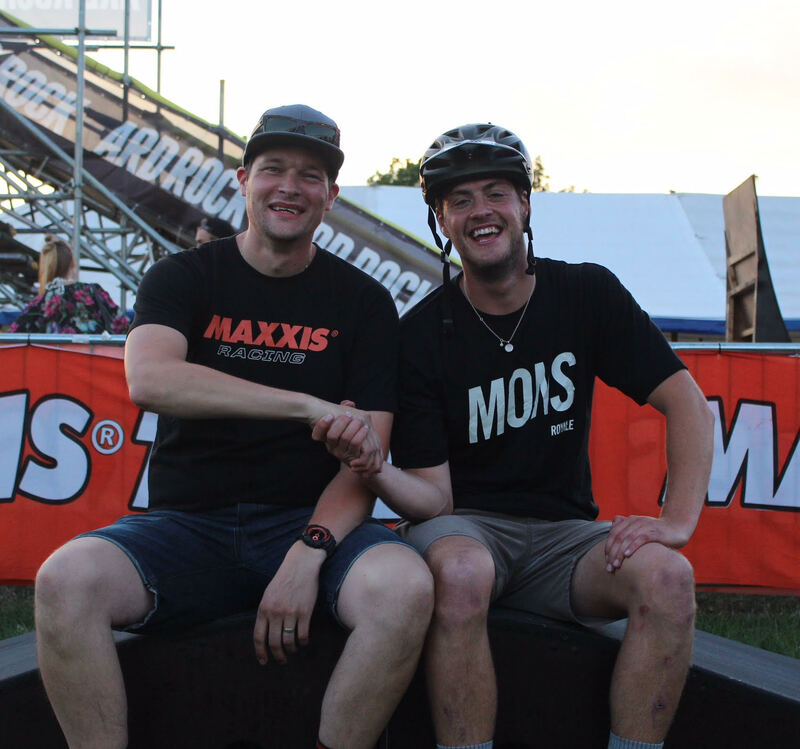 Maxxis Bicycle Brand Manager, Steve Robinson with pump track winner, Jono Jones. Among its racers tackling the 45km ‘Ard Rock Enduro event were “Sheffield Steel” Steve Peat, who lived up to his legendary status by taking first place in a blistering 19 minutes and 25 seconds. Also riding on Maxxis tyres was Danny Hart of Madison Saracen Factory Racing, who came within four seconds of “Peaty” in the second position, while Sam Flockhart of Intense Racing UK scooped 5th position in a time of 19 minutes and 43 seconds. The result means three riders on Maxxis tyres finished within the top 5, with Peat and Hart being crowned ‘Ard Rock champion and runner-up respectively. Also taking part over the weekend in Maxxis colours was Team Japspeed pro drifter Paul ‘Smokey’ Smith and Maxxis graphic designer Neil Catchpole. As relative newbies to the MTB scene, the pair were challenged by Maxxis to scale the challenge of the ‘Ard Rock Sport event as part of its #ArdRockReady campaign. The pair successfully completed the gruelling test, with Paul and Neil finishing in a respectable 406th and 981st position respectively. As a sponsor of ‘Ard Rock, Maxxis UK lent its support to hundreds of riders over the course of the three-day festival, with many entrants choosing the leading tyre brand’s DoubleDown technology to take on the tough terrain of the Yorkshire Dales. As well as the Maxxis stand in the event village, the official Maxxis maintenance tent at stage three, of course, was also an essential resource for riders looking to make it the finish line. Maxxis made sure riders could keep going on their favoured tyres by offering 50% off replacement Maxxis tyres, with all damaged tyres set to be recycled. It proved to be an invaluable tool to hundreds of competitors who might not have gone the distance without the support. Another highlight of the ‘Ard Rock weekend was the Maxxis Pump Track Championships. After seeing off seven other contestants In Saturday’s grand finale, MTB rider Jono Jones was successfully crowned champion to secure Maxxis sponsorship for the second year running. With ‘Ard Rock over for another year, attention now turns to the 2018 Tour of Britain in September for the world-renowned cycle brand, where it will be showcasing its support for its sponsored road racing team Canyon Eisberg.